Like many multiethnic multicultural people, I’ve had difficulty coming to terms with my multifaceted yet fragmented identity. As a half-Iranian in the midst of Americans, I’ve lacked key cultural influences and a US-centric worldview, while in Iran I feel like an outsider at times. I’ve had the wonderful opportunity to visit twice so far—once as a teenager and once more recently as a physicist. Each time, I’ve been very observant in the hopes of better understanding an important side of myself. I’ve explored its fascinatingly unique cities, including the massive capital, Tehran, and its huge bazaars; Esfahan, with its spectacular architecture and Jahan Square, a national landmark; and Shiraz, with its tombs of poet giants, Hafez and Saadi. I’ve also looked for signs of how the country appears to be changing as it becomes more open to the international community. 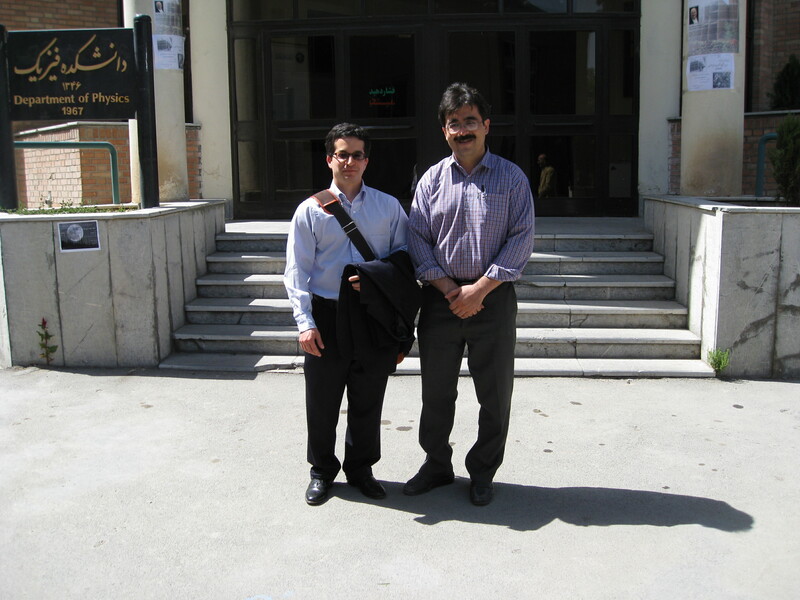 At the invitation of Sohrab Rahvar, physics professor at the University of Sharif, I gave two seminars, one there and another at the University of Tehran. I presented postdoctoral research I was doing at the Max Planck Institute for Astronomy in Heidelberg, Germany, investigating connections between observations of galaxies and theories of dark matter. I introduced myself in Farsi and gave the talks in English—the usual second language there. I had learned Farsi from my mother in the US, and I had a pretty good accent too, but I lacked the vocabulary to communicate astrophysics in the language. I found out though that, for example, like in English, Iranians use the same word for a “cluster of galaxies” and a “cluster of grapes”. After my presentations, the students asked challenging questions about my work—both in English and Farsi. One student asked me for advice, as she was preparing a job application for the Max Planck Institute for the Science of Light, near Nuremberg. For all their talent and promise, students and scientists like her face many difficulties under the tough nuclear-related sanctions imposed on Iran. Many have a hard time traveling to conferences, obtaining student visas, or meeting with international colleagues. Even the Iranian physicists who played an integral role in the CERN Large Hadron Collider collaboration ran into restrictions. Obtaining professional journals and lab equipment can be prohibitively expensive for Iranian scientists too. Perhaps for these reasons, many scientists shifted to theoretical rather than experimental work; for example, I met surprisingly many string theory researchers there. Science, medicine and mathematics have a long and glorious history in Iran and Persia. Six centuries before Galileo, the physicist Biruni was the first scientist to propose that the speed of light is finite. Ibn al-Haytham developed the field of optics, Ibn Sina (known in the West as Avicenna) made important contributions to medicine and philosophy, and the 11th-century poet Omar Khayyam—author of The Rubaiyat—also happened to figure out the principles of algebra and devised an accurate solar calendar. Observatories proliferated throughout Persia then, and precise planetary records collected at Maragheh observatory, in what is now northwestern Iran, likely influenced Copernicus’s hypothesis that the Earth revolves around the sun. A thousand years later, Iran is a nation of 78 million people, almost as populous as Germany. More than half the population is under the age of 35—many of them politically active—and male and female young adults have a literacy rate of 97 percent. According to the Institute of International Education, 10,200 Iranian students and nearly 1,400 scholars studied at US colleges and universities, making it the 12th leading country to send students to the US. In 1979, however, more than 51,000 students enrolled in U.S. universities—the biggest source of overseas students. The large Iranian diaspora have been known for their accomplished work in science and other fields, but according to the International Monetary Fund, this has fueled the highest “brain drain” among developing and developed countries, with 150,000 to 180,000 educated people emigrating every year. But now that may change. As the international sanctions will be gradually lifted, students and scientists in Iran and their colleagues abroad have much to look forward to. As part of the historic nuclear deal, the uranium enrichment facility in Fordo, between Tehran and Esfahan, will be converted into an international nuclear physics and technology center. Iranians have other plans in the works too. Within the next 4 or 5 years, astronomers are working on building a new observatory, a 3.4-meter optical telescope, on a 12,000-foot peak in central Iran at a site comparable to Hawaii’s Mauna Kea. Once it’s completed, the international community will be invited to use up to 70 percent of the observing time to study planets outside the solar system, gamma-ray bursts, distant galaxies and elusive dark matter. I hope to see the telescope the next time I travel there. In addition, Iranian physicists plan to construct an ambitious $300 million “synchrotron” particle accelerator. Like the telescope, it would be difficult to complete on schedule, if at all, were the sanctions not removed. Iranian scientists and their international partners excitedly anticipate new experiments on a wide range of subjects, from research on biological molecules to advanced materials. “Big Science” is not limited to the West. Other sciences also look forward to a changing environment, as described in a Science special issue on science in Iran. Rahvar seems optimistic about the post-sanctions situation. “We hope to reestablish our previous scientific relations and make new collaborations,” he says. It will take time, but the prospect of an improving research climate in Iran could herald a new era of scientific achievements in the country, especially in the physical sciences. I think that a more open political environment in Iran won’t just invigorate science in the country and in the international community; with time, it will stimulate a more open exchange of ideas and cultural understanding. I’m proud of my Iranian blood, and I excitedly await Iran’s renewal and resurgence.